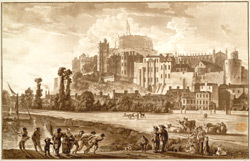 View of the town of Windsor with Windsor Castle in the background. The main visible features of the castle, including the round tower built on the highest point of the castle mount and St George's chapel. The River Thames was the main transportation route between London and Windsor, and the waterfront traffic in this area was particularly busy.